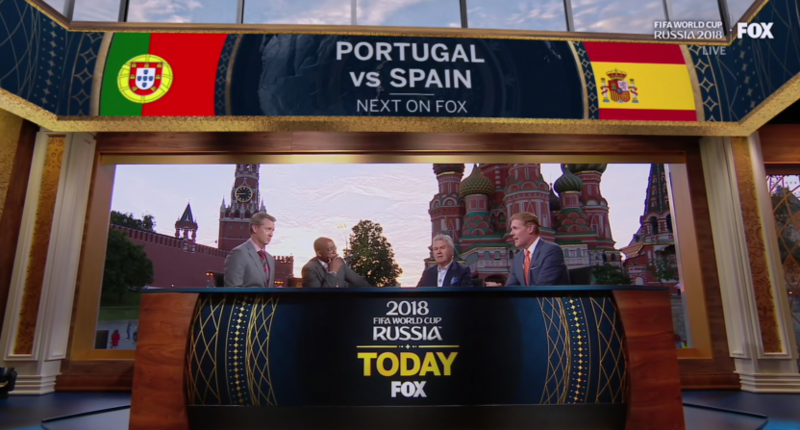 From Volkswagen commercials to Tony Meola, there will be some things that we'll remember about Fox's World Cup coverage. After one wild month, the 2018 FIFA World Cup concluded with a resounding 4-2 French victory over Croatia. As France celebrated their second World Cup, it was the conclusion of Fox’s first Men’s World Cup. Fox began their relationship with FIFA in 2015 for the women’s tournament and is set to broadcast both versions through at least 2026. Now that the World Cup is over and we begin the countdown to next year’s version, we have some takeaways from Fox’s coverage that will remain with us. I already made my thoughts known about how Fox presented this year’s World Cup. I have a difference of opinion in that I feel the production is too centered around new fans and Fox could do their broadcasts in a way that is more insightful and wouldn’t scare away new viewers and new soccer fans. Despite my personal feelings about their broadcasting style and the consistent criticism from other people within sports media of Fox programming like World Cup Tonight, I’ll give Fox some credit for their hard work in bringing a month-long production to completion from halfway around the world. We may take it for granted because we don’t always see what happens behind the scenes but hundreds of people spent lots of time preparing and producing this event. Sure, many things about the broadcast over the entire month wasn’t perfect and there was the thing about Stalin’s house that was on another level of strange but at least on the technical side, getting it on the air and being able to organize something as intricate and detailed as a month-long soccer tournament, I’ll cut Fox some slack. Among the bright spots of Fox’s broadcasting have been match analysts Tony Meola and Aly Wagner. These two aren’t new to broadcasting or to Fox Sports but they became the breakout stars. Wagner and play-by-play partner Derek Rae had immediately great chemistry and I felt she vastly improved in comparison to her previous role as a studio analyst where I thought Wagner wasn’t as good in. As for Meola, I’m not sure how I felt about his specific performance this month. He wasn’t bad by any stretch but I don’t think he was great either. I’ll say he was good with some room to improve. What I do know is that it’s important that Meola was a part of the broadcast because he was a goalkeeper and having that perspective could be a major asset. ESPN and NBC both have goalkeepers on their networks (Shaka Hislop and Kasey Keller on ESPN and Tim Howard on NBCSN) and it’s an added layer crucial to a broadcast. Especially in a tournament setting where there are going to be penalty shootouts, it’s huge to have someone on there who had to keep those shots out and give us a sense of what the goalkeeper is thinking and the psychology of what a penalty entails. That kind of perspective is something that even viewers who used to play soccer may not know about. Not everyone played goalkeeper so there’s an opportunity for Meola to be a valuable resource on a broadcast for both new and diehard fans in addition to his ability to call a match, even if he sounds a lot like Troy Aikman. Fox had the majority of World Cup matches on broadcast TV and when that happens, you’re essentially at the mercy of the affiliates. So for this, Fox Sports doesn’t really have much control over but for example, my local Fox affiliate decided to air The Steve Wilkos Show after weekday matches. Nothing against Steve Wilkos or any other form of trash TV that’s syndicated in daytime but it’s a strange juxtaposition to go straight from one to the other. I think I was sick of the commercials after the second day of the tournament. Sure, the Geico commercial about the endless slide was somewhat amusing the first few times you see it but it gets to be a chore after a while. Same with the various Volkswagen commercials wanting people to “jump on the wagen” and Landon Donovan’s pro-Mexico Wells Fargo commercial. Fox isn’t the only one who does this and they aren’t even really at fault. If you watch NBC’s Premier League coverage, it’s usually the same commercials as well with Volkswagen being the biggest offender. I appreciate Volkswagen investing in soccer, but my goodness do they need to lighten up and switch up their commercials more often. Whether you love or hate Fox’s coverage, they’re going to be around until at least 2026, so those people who aren’t thrilled will have to make the best of it. I find myself looking toward next year. Fox Sports mostly received praise for the 2015 Women’s World Cup and provided coverage that hadn’t been seen in the women’s game. It was treated like it was a Men’s World Cup and I wondered if Fox would tailor their broadcasts like in 2015 or be like this year where some broadcasting crews were in LA instead of Russia. This may help ease some fears. Fox has already been at work planning for the Women’s World Cup. For those who may have taken issue with Fox keeping some crews in LA this year, a Fox Sports source told Awful Announcing that they are planning to have everyone in France. At the end of the day, Fox put out a broadcast that people either loved or hated. A lot of people, especially soccer fans, hated it. A lot of people loved it, and if it was Fox’s strategy to cater to new and casual fans, they knew and accepted that it was going to turn off diehard fans. I didn’t have to like everything about Fox’s broadcast either, and I didn’t; but I understood the strategy behind it and can still appreciate everyone putting in long hours before and during this tournament and at least trying to change some things on the fly to produce a better broadcast. Hopefully they take what they learned here and improve upon that for future World Cups.